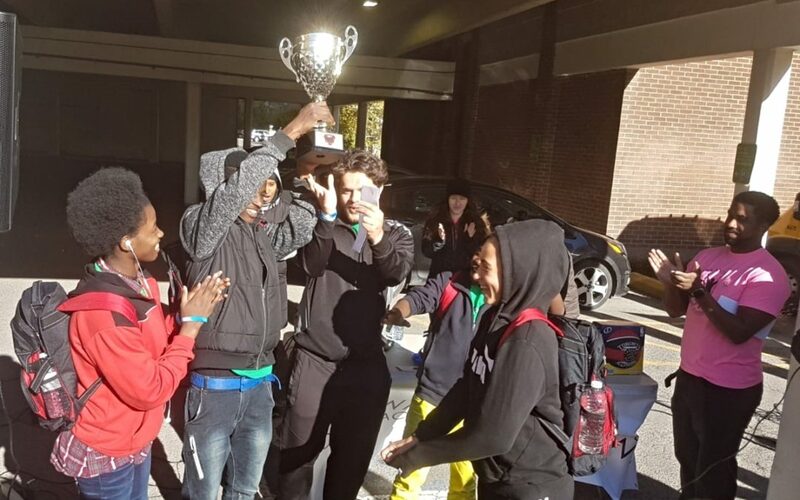 Two times was the charm as the Catholic Centre for Immigrants Ottawa youth team claimed victory in the annual Ottawa Youth race. This is the second year in a row CCI has captured the trophy. The race took place in late October. The Ottawa Youth Race is about helping youth connect with other young people around the city and learn about organizations that help young people. It’s also about having a lot of fun. Youth Program facilitator Nour says the race is especially a great activity for young newcomers. As young newcomers, they are not aware of all of the organizations that are here in Ottawa to help them. “It’s very important for newcomer youth to participate because once they get into these places, they get to know what the organization is all about. They know where it is, they meet the staff, they get to know what the organization specializes in. This is really helpful information to before you seek help,” says Nour. The purpose of the race was to solve a series of riddles. Solving each riddle led them to a specific organization where they had to perform in an activity that helped them learned about that organization and the services they provided. While on site, young newcomers had a chance to ask questions and find out more about how that organization could help them with any future issue they might face. After each stop, the team gets a stamp. The first team to solve all the riddles, collect all the stamps and get back to the starting line, wins. This year’s race featured 20 different youth teams with three teams from CCI. “I think the enthusiasm was a big part of why we won,” says Nour.